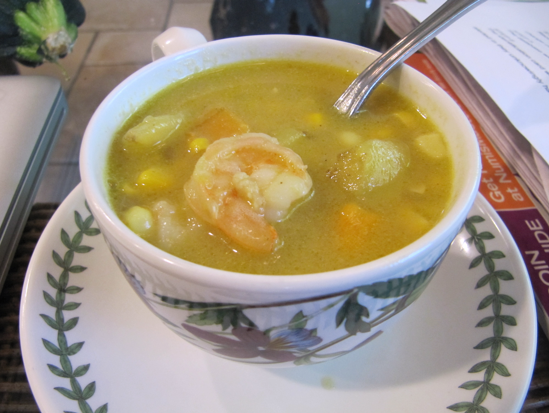 We had lots of leftover corn from dinner on Saturday night, so on Sunday I decided to try a recipe from Southern Living magazine that I have had my eyes on for a few months now: Curried Shrimp and Corn Chowder. I easily found the recipe on MyRecipes.com, a site that brings together recipes from Time Inc. magazines including Cooking Light, Southern Living, Real Simple, ALL YOU, Health and more. 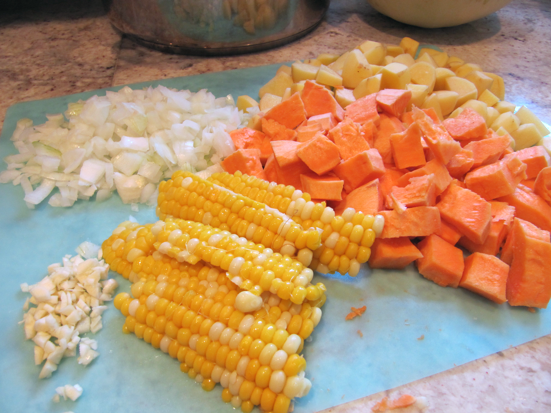 The recipe called for 5 ears of corn, an onion, garlic, yukon gold and sweet potatoes, chicken broth, coconut milk, curry powder, and raw shrimp. I found it easiest to prep all of the ingredients before starting up the stove; I can report that it is not easy to chop a sweet potato up into diced pieces, but it is possible. I sauteed the onion and garlic in olive oil first and then added all of the potatoes, the chicken broth and coconut milk, the curry powder, salt, and pepper. I did not add the corn at this time as specified because my corn had already been cooked from the night before. If you are using raw corn, however, it goes in at this time. This mixture was brought to a boil and then cooked on low for about 25 minutes until the potatoes were cooked through. When the potatoes were tender I added the corn and cooked on low for another 5 minutes. I did notice that when the corn was added the chowder became very thick. I decided to add one more can of chicken broth. I was afraid that this would water down the flavor, but it was a risk that had to be taken. 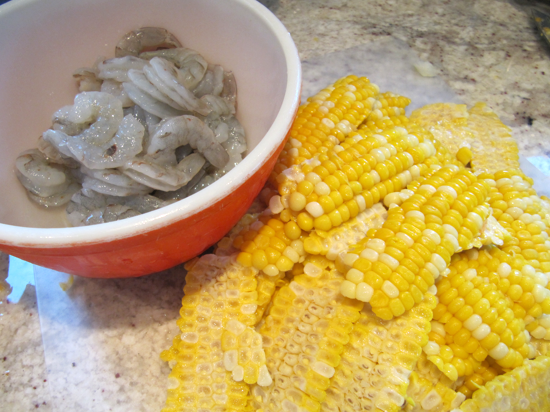 Finally I added the shrimp and turned the heat off after three minutes when they had all begun to turn pink. I was careful not to leave the flame on for too long after adding the shrimp because they cook quickly and even keep cooking in the hot soup after the stove is off. I reheated the soup about an hour later and served to my family and friends at dinner. It was a HUGE hit. 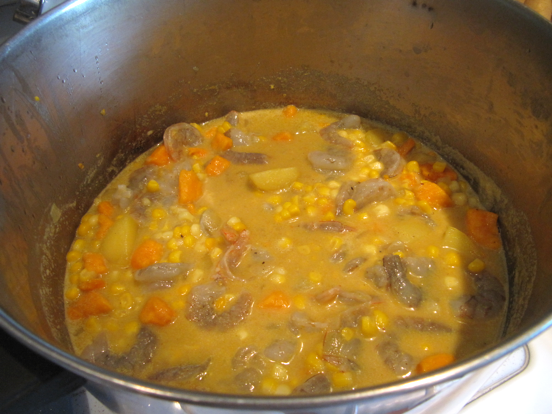 The curry, coconut milk and sweet potatoes added such nice, subtle flavors to the traditional corn chowder. I don't think the soup was watered down much from the extra chicken stock that I added, but next time I would account for this change in the beginning and perhaps use 1.5 cans each of chicken stock and coconut milk and a bit of extra curry powder. This chowder was nice and light and was perfect for a summer evening! You can find this recipe here. Let me know if you make it!